Paul Victor Jules Signac (French: [pɔl siɲak]; 11 November 1863 – 15 August 1935) was a French Neo-Impressionist painter who, working with Georges Seurat, helped develop the Pointillist style. Paul Signac was born in Paris on 11 November 1863. He followed a course of training in architecture before deciding at the age of 18 to pursue a career as a painter after attending an exhibit of Monet's work. He sailed around the coasts of Europe, painting the landscapes he encountered. He also painted a series of watercolors of French harbor cities in later years. In 1884 he met Claude Monet and Georges Seurat. He was struck by the systematic working methods of Seurat and by his theory of colors and became Seurat's faithful supporter, friend and heir with his description of Neo-Impressionism and Divisionism method. Under Seurat's influence he abandoned the short brushstrokes of Impressionism to experiment with scientifically juxtaposed small dots of pure color, intended to combine and blend not on the canvas but in the viewer's eye, the defining feature of Pointillism. Many of Signac's paintings are of the French coast. He loved to paint the water. He left the capital each summer, to stay in the south of France in the village of Collioure or at St. Tropez, where he bought a house and invited his friends. Paul Signac, Albert Dubois-Pillet, Odilon Redon and Georges Seurat were among the founders of the Société des Artistes Indépendants. The association began in Paris 29 July 1884 with the organization of massive exhibitions, with the device "No jury nor awards" (Sans jury ni récompense). "The purpose of Société des Artistes Indépendants—based on the principle of abolishing admission jury—is to allow the artists to present their works to public judgement with complete freedom". For the following three decades their annual exhibitions set the trends in art of the early 20th century. At the 1905 Salon des Indépendants, Henri Matisse exhibited the proto-Fauve painting Luxe, Calme et Volupté. 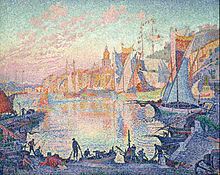 In the Divisionist technique and brightly colored, it was painted in 1904, after a summer spent working in St. Tropez on the French Riviera alongside the neo-Impressionist painters Paul Signac and Henri-Edmond Cross. The painting is Matisse's most important work in which he used the Divisionist technique advocated by Signac, which Matisse had first adopted after reading Signac's essay, d'Eugène Delacroix au Néo-Impressionnisme in 1898. Signac purchased the work after the 1905 Salon des Indépendants. In 1908 Signac was elected president of the 24th Salon des Indépendants. In 1886 Signac met Vincent van Gogh in Paris. In 1887 the two artists regularly went to Asnières-sur-Seine together, where they painted such subjects as river landscapes and cafés. Initially, Van Gogh chiefly admired Signac’s loose painting technique. In March 1889, Signac visited Van Gogh at Arles. The next year he made a short trip to Italy, seeing Genoa, Florence, and Naples. In 1888, Signac discovered anarchist ideas by reading Elisee Reclus, Kropotkin and Jean Grave, who all developed the ideas of anarchist communism. With his friends Angrand Cross, Maximilien Luce and Camille Pissarro he contributed to Jean Grave’s paper Les Temps Nouveaux (New Times). His financial support was considerable; he sent regular cheques and made a gift of his works for five lotteries between 1895 and 1912. Signac's 1893 painting, In the Time of Harmony was originally titled In the Time of Anarchy but political repression targeting the anarchists in France at this time forced him to change it before the work could be accepted by a gallery. Signac loved sailing and began to travel in 1892, sailing a small boat to almost all the ports of France, to the Netherlands, and around the Mediterranean as far as Constantinople, basing his boat at St. Tropez, which he "discovered". From his various ports of call, Signac brought back vibrant, colorful watercolors, sketched rapidly from nature. From these sketches, he painted large studio canvases that are carefully worked out in small, mosaic-like squares of color, quite different from the tiny, variegated dots previously used by Seurat. Signac served as a juror with Florence Meyer Blumenthal in awarding the Prix Blumenthal, a grant given between 1919 and 1954 to painters, sculptors, decorators, engravers, writers, and musicians. On 7 November 1892 Signac married Berthe Roblès at the town hall of the 18th arrondissement of Paris; witnesses at the wedding were Alexandre Lemonier, Maximilien Luce, Camille Pissarro and Georges Lecomte. In November 1897, the Signacs moved to a new apartment in the Castel Béranger, built by Hector Guimard, and a little later, in December of the same year, acquired a house in Saint-Tropez called La Hune; there the painter had a vast studio constructed, which he inaugurated on 16 August 1898. In September 1913, Signac rented a house at Antibes, where he settled with Jeanne Selmersheim-Desgrange, who gave birth to their daughter Ginette on 2 October 1913. In the meantime Signac had left La Hune as well as the Castel Beranger apartment to Berthe: they remained friends for the rest of his life. On 6 April 1927, Signac adopted Ginette, his previously illegitimate daughter. His granddaughter, Françoise Cachin, was an art historian. Paul Signac died from septicemia in Paris on 15 August 1935 at the age of 71. His body was cremated and buried three days later, on 18 August, at the Père Lachaise Cemetery. Some of his well-known paintings are: In the Time of Harmony, Femmes au puits, Port St. Tropez, The Papal Palace, and The Demolisher. In 2010, a previously unknown work was discovered at a hotel which was preparing an exhibition of its many paintings. The Hotel Spaander [nl] in Volendam has about 1,400 works of art and Signac apparently gave this one to pay for his stay there in 1894. Valued at €100,000, the untitled oil "representing a view of the harbour used to hang off a rusty nail in the lobby". Signac left several important works on the theory of art, among them From Eugène Delacroix to Neo-Impressionism, published in 1899; a monograph devoted to Johan Barthold Jongkind (1819–1891), published in 1927; several introductions to the catalogues of art exhibitions; and many other still unpublished writings. Politically he was an anarchist, as were many of his friends, including Félix Fénéon and Camille Pissarro. ^ "Société des Artistes Indépendants". www.artistes-independants.fr. ^ Oxford Art Online, "Henri Matisse"
^ Christie, Stuart (27 March 2010). "The World That Never Was: A True Story of Dreamers, Schemers, Anarchists and Secret Agents". Pantheon. ^ "Florence Meyer Blumenthal". Jewish Women's Archive, Michele Siegel. ^ Collin, Branko. Paul Signac Painting Discovered in Volendam Hotel, 27 February 2010. Wikimedia Commons has media related to Paul Signac.